Update v1.4 for PayPal Digital Downloads is here. PayPal Digital Downloads is a script that allows you to sell digital products directly on your website. With this script you donâ€™t have to install complicated shopping carts and create their design to match your website. PayPal Digital Downloads is the easiest and perfect way to distribute digital products for download and monetize website. - Migration on Bootstrap v4. - Updated Font Awesome to the latest version 5.0.6. - Fixed bugs with Free Download files. - Replacement of the modal by a page dedicated to the free download of the file. - Added URL Rewriting for the free download page. - Improvements to the upload and home pages. - Improved Modern & Simple versions. - Added Thumbnail image preview. - Added security for folders & files. - Added protected settings & (improved) upload pages. - Added Free Download system. - Improved transactions log (now visible on the settings page). - Added the possibility to delete an item. 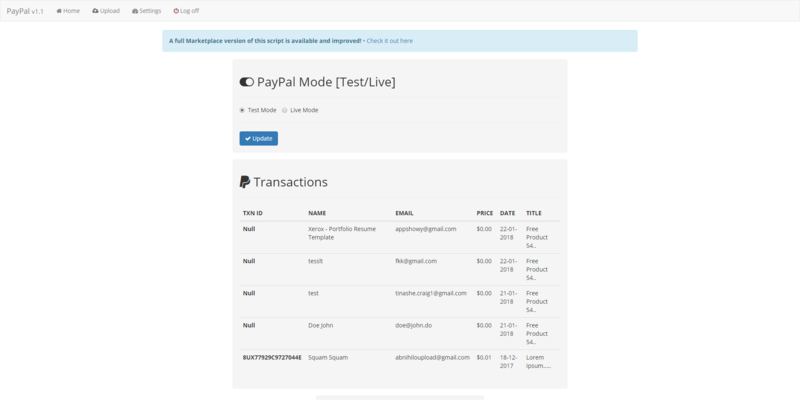 - Added the possibility to change PayPal Mode [Test/Live] on the settings page.